Rogue Valley, Oregon, is 11 miles north of Medford. It’s in southwestern Oregon along the middle Rogue River and its tributaries in Josephine and Jackson counties near the California border. The largest communities in Rogue Valley are Medford, Ashland and Grants Pass. We live in Coos Bay, Oregon, on the coast. We usually have LOTS of hummingbirds, 7 – 10, that will all feed at the same time. We have four feeders outside of our house. There hasn’t been even one hummingbird in the past week. Yesterday we took the feeders down, cleaned them out and made fresh food. Nothing. Not one hummingbird. So, your article was timely and interesting. March 19, 2018 Rogue Valley, Oregon – Earthfiles has been receiving worried emails from viewers and listeners who sense that something is significantly wrong in a number of American communities — ranging from absence of insects and pollinators to missing birds. This morning I received the following email from a man who has lived in southwestern Oregon’s Rogue Valley eleven miles north of Medford for 30 years. What he describes in his email are such striking changes around him that he now wonders if a large seismic event is about to happen and the birds at least know in advance. 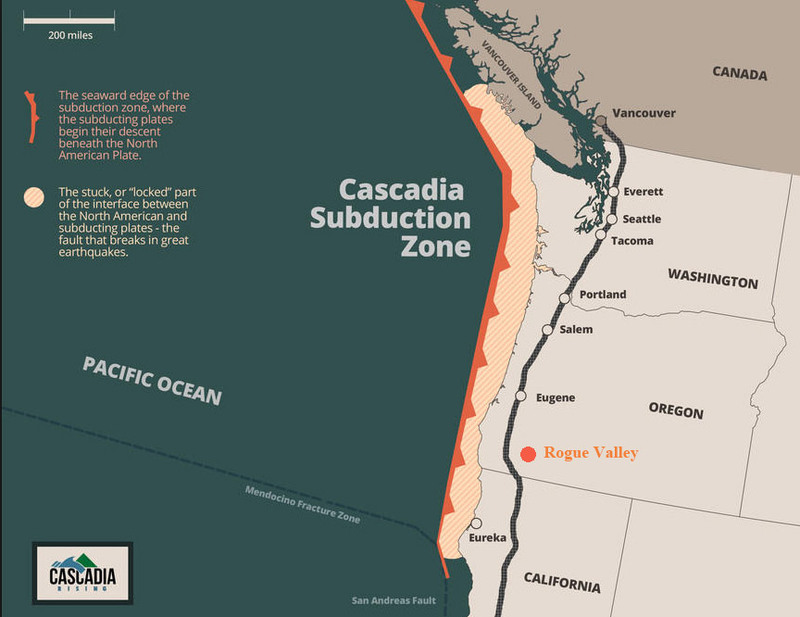 “The Pacific Northwest hasn’t been rocked by a major earthquake from the Cascadia Subduction Zone in about 330 years, yet science has established that the Cascadia Subduction Zone blows on average every 300 years, so we’re overdue. But what makes the CSZ so dangerous is that it can hit 9.0 or more on the Seismograph, which would absolutely decimate the Oregon coastal communities from shaking, fires and tsunamis, but would also isolate most of Oregon, Northern California and parts of Southern Washington due to collapsed highway and other travel infrastructure on a massive scale that will make rescue and recovery efforts very difficult. Many people will die, especially if Portland is hit hard, because the population of Oregon 330 years ago was minuscule compared to what it is today. [ Editor’s Note: The history of earthquake investigations in California has been largely focused on the San Andreas Fault System, due to its strong influence in the state as the boundary between the Pacific Plate and the North American Plate. The San Andreas Fault is the most studied on Earth because of the large populations that live near it. Andrew Lawson, a geologist from the University of California, Berkeley, had named the fault after the San Andreas Lake prior to the 1906 San Francisco earthquake. That’s when the San Andreas Fault ruptured for a length of 290 mi (470 km) during the 1906 shock, both to the north of San Francisco and to the south in the Santa Cruz Mountains region. “Most people don’t have a clue what a 9.0 earthquake can do. The power of an earthquake from 7.0 to 8.0 is ten times that of 7.0, and from 8.0 to 9.0 is another ten times the power of an 8.0. The earthquake I personally experienced was a 7.2 and lasted only about 15 seconds followed by months of very strong aftershocks. The CSZ could rumble for several minutes at 9.0, and I am very worried in view of what the birds are telling me. [ Editor’s Note: In the 1990s, the U. S. Geological Survey (USGS) swtiched its definition of seismic magnitude from the Richter scale to a “moment magnitude scale.” The USGS earthquake website states: “as an estimate of energy, each whole number step in the magnitude scale corresponds to the release of about 31 times more energy than the amount associated with the preceding whole number value. For each whole-number increase in magnitude, the seismic energy released increases by about 31 times. That means a magnitude 7 earthquake produces 31 times more energy — or is 31 times stronger — than a magnitude 6. So today I am parking my vehicles away from my house and out of my garage. I am keeping the fuel tanks full with extra gasoline stored safely. And I am making sure my water filters, survival food, firearms and ammunition are stored away from my house -— which is very well built and strong because I designed and built it myself. But my house at 9.0 magnitude quake? Forget it! A 9.0 lasting a minute or more will collapse just about every structure currently standing in Southern Oregon. Rogue Valley, Oregon, with the Crater Lake National Park 42°54′43″N 122°08′53″W to the east that encompasses the caldera of a destroyed volcano, Mount Mazama, and the surrounding hills and forests. Crater Lake is 1,949 feet (595 m) deep, which is the deepest lake in the United States. UPDATE – March 24, 2018 Rogue Valley, Oregon – Since my March 19th Earthfiles report and March 21st Earthfiles YouTube Update about the puzzling and disturbing lack of birds in Rogue Valley, Oregon, near Medford, and possible link to impending earthquake in the Cascadia Subduction Zone there, I have received the following comments from viewers and listeners. I live in the Grants Pass Oregon valley. I have only lived here for a few years, but one of my joys of the valley is feeding my birds! Swallows, hummingbirds, robins throughout the season and especially the winter. I have 2 large bird feeders and 2 hummingbird feeders that I’ve been refilling all winter — until about a week ago! Nothing — no birds! We also have a large population of geese that are always in our park, but nothing for over a week? We also own a home in the Smith River Oregon area. We have also noticed our large robin population has vacated? We have lived in that area for over 40 years. The robins are always, always early morning feeders for us. Have not seen ANY in over a week? We will be even more aware now to see what our large elk population and wildlife are doing…. North Natomas, California, is between the Sacramento Int’l. Airport and downtown Sacramento in central northern California. I live in North Natomas, California. We are North of Sacramento by a short distance. After reading your Earthfiles.com article about missing birds in Oregon, I have to add something I have noticed here. I have been following the migration of Snow Geese from my backyard for nearly 18 years. As well as the hummingbirds. I live along the Pacific Flyway, so I have a good vantage point. For the past several years, Snow Geese have been changing in their “fly times.” And this year has been even more perplexing. They would usually start to fly over, heading North in early October. But in October 2017, it was later than usual in the month. After I see them for several weeks, I don’t see them again till the following year. It is awesome to see them flying at night when the moon is bright. I look forward to it and wait eagerly. This year 2018, the Snow Geese have been flying North and South almost at the same time. They are usually long done by now. I have never seen THIS before. About 10 days ago was the last I’ve seen them going North again. Now, I realize they are of a huge population, but this is very odd. And, as for the hummers, we have only had one! Usually we have several that stay all year round. As well as the migratory ones. Butnothing this year so far. I too am concerned as I feel this is a sign from Nature. I live in Shady Cove just outside of Medford on the Rogue River. What Linda Moulton Howe has reported about the swallows — we have the same problem here. I watch the bird species very closely all through the seasons of what comes and goes. This year’s been off. Let’s hope it’s not so dramatic for Oregon and the world. Re: Something going to happen in Southern Oregon? We live in Coos Bay, Oregon, on the coast. We usually have LOTS of hummingbirds, 7 to 10 that will all feed at the same time. We have four feeders outside of our house. There hasn’t been even one hummingbird in the past week. Yesterday we took the feeders down, cleaned them out and made fresh food. Nothing. Not one hummingbird yet. Thank you, Linda, for Earthfiles. Re: What’s happened to the birds, where are they? I just finished listening to your YouTube updates, and the story concerning the Oregon community member that is reporting not seeing hummingbirds at this time. I do believe that animal behavior can indicate changes to come or within an environment or region. Animals have attributes that are much more sensitive than human faculties to detect many things. I couldn’t help but think of the amount of toxic air pollutants that might alter bird behavior or even cause mortality events. But I bet you know a great deal. It could just be the causal factor, along with weather pattern changes to disrupt the hummingbirds. Where is all the Aluminum contamination coming from? Hey Oregoners, Those darn humming birds are over here in the great state of California where we are used to earthquakes. I guess those critters picked up and just left your state to come to the state of milk and honey. They got tired of all those trumpsters living there and hate they spew in the Rogue Valley and down the coast from Coos Bay. I lived in Oregon 1.5 years and know you very, very well. The numbers don’t lie. In spite of the economic woes of Southern Oregon, Trumpsters gather in droves and preach the gospel of Trumpism. They believe Trump is the answer to their economic recovery. But, you know it, and I know it, there will be no economic recovery. Trump does not care about you.